A thick frost but clear skies greeted us this morning – pale watery winter sun but a welcome change because we have not seen blue sky or sun since we arrived. Everyone here scrapes the ice off their windscreen – and every car seems to be equipped with a paint scraper for the job (though Lauren tells me it’s a windscreen scraper – it sure looked like a paint scraper to me!) Dagmar had sent a parcel for us… she is such a gem .. inside a “Welcome to Germany” pack - a collection of maps & sightseeing brochures and some chocolates & lebkuchen. We had a late breakfast with Lauren at the Stadtcafe (proper breakfast with scrambled eggs) and did a bit of shopping before she went ‘back to work’ (to walk the dog for 2 hrs) at mid-day. Rugged up against the cold (it was 2 degrees) we caught a 2.15pm train to Speyer – about 40min south-east of Worms and home of the World Heritage listed KaiserDom (Kings Cathedral). 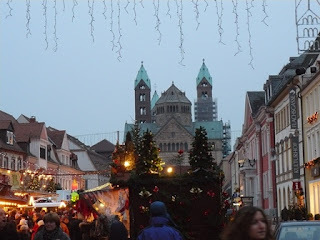 Our lander ticket gave us the return train trip from Worms to Speyer as well as all local transport in Speyer (for all 3 of us) so we jumped on a bus from the train station to Posteplatz which is the start of the pedestrian only shopping precinct leading to the Dom. Speyer is a really beautiful city, much of which escaped the devastation of WW2. Lovely old buildings, cobbled streets, and beautifully decorated shop-fronts lining the streets. Dozens of Christmas trees (with decorations by the local primary school kids, the paper ones laminated as protection against the rain), xmas lights and lots of cut conifer and red ribbons everywhere. Despite living in Germany for 6 months, Lauren had managed not to be wearing enough layers of clothes so she & Tony went in search of another jumper for her and I managed to order 2 coffees & a hot chocolate at a little café. Warmed and clothed we headed down past the Christmas markets to the Dom. It was by now getting on towards 4pm and although it was light enough to see inside the cathedral, it was not light enough to take photos that come anywhere near doing the place justice. It is amazing! Lauren wondered why she, the dirty little heathen didn’t instantly burst into flame on entering, Tony made lots of blasphemous jokes and we escaped unharmed an hour later. It really is a magnificent building and to see it on a bright sunny day when there is light streaming in through the windows would be incredible. After the Dom we headed for a proper investigation of the Xmas markets, stopping on the way to buy a Bratwurst and then another glass ornament for my collection. It had started to rain by now, so after some more market wandering, and in need of finding somewhere dry dinner seemed the sensible thing to do. Schnitzels all round and as we were leaving, the lady in the restaurant mentioned there were to be fireworks at the Old Town Gate at 7.30pm. Even without being told we would soon have figured something was going on as a sea of umbrellas came walking down the road. They were pretty spectacular going off over and along the front of the Medieval Town Gate… even if we were standing in the rain. Train back to Worms and a nightcap at the Stadtcafe rounded out another thoroughly enjoyable day. We’re meeting Dagmar on the 8.55am train to Mainz tomorrow (she’ll get on the train at Nakenheim) … looking forward to finally meeting her and seeing where Lauren spent 2 months in 2005.